Activate Coupon Save $120.00 instantly on QuickBooks Premier 2015! Not only can you now get $120.00 off on QuickBooks Premier 2016 or any of the other industry-specific editions when you use the automatic discount link above, but you will also qualify for free shipping. Best of all, no special offer codes are needed to be entered at order checkout as you should already see the promotional price applied to your cart when you follow the above link. This is a limited time offer that is available exclusively at Intuit.com. 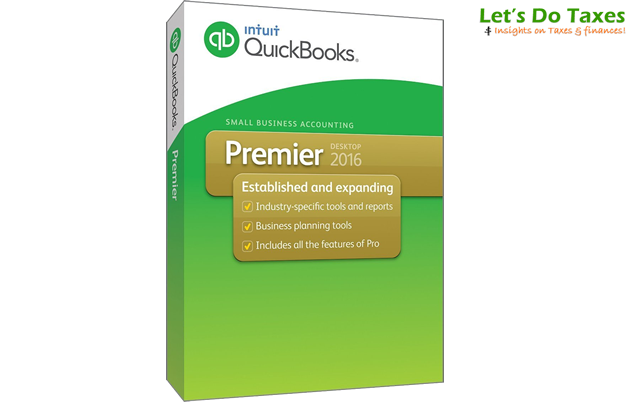 Up to $160 OFF Amazon has QuickBooks Premier 2016 now on sale for $160.00 off. Amazon has all of the best deals this week on all of the new 2016 QuickBooks editions, with the Premier version on sale for up to $160.00 off. That’s about 32% off the listed retail price. You’ll also be able to instantly download your order once it’s available so no need to wait and be checking your mail box for the physical box to arrive. But as always, if you need to physical box, Amazon will send it out to you for free anywhere in the United States. Free Trial Offer Try any of the online versions of QuickBooks for free. Although there is no free trial version of Premier 2016, you can try any of the QuickBooks online editions for free. Most of the features are the same except that you don’t need to download any software (because the online feature is 100% web-based – good for those working on the go from their iPad, home laptop, work computer, etc., that don’t want to be tied down to just a single PC). Just be sure to cancel your trial before the 30 day period if you decide not to go with this option as then will begin charging you a monthly subscription fee after that point. Growing business is not only exciting but also challenging. New personnel, more transactions to process, the need to keep track of hundreds of details, meetings, and due dates already sound like a lot to handle. QuickBooks Premier is the older “brother” of QuickBooks Pro not only offering the same features but also granting access to more users at the same time (5 versus 3). Two other traits of this version, that distinguish it from QuickBooks Pro, are greater insight into balance sheet and inventory. You now have more freedom how you analyze the company’s financials. Balance sheet can be viewed in overall numbers or be broken down depending on location (perhaps you have two or three stores), department, or geographic site (operations in different counties, states, etc). For easy comparison and further analysis all that data is presented in one report letting you see major differences with just a glance. When you select a product in Inventory Center it brings up all the pertinent information related to that item. It can include notes, reorder points, see who purchased it and how many, current inventory, and cost. In fact, you can customize this section to display information you really require. This allows for more precise and efficient management especially for manufacturing companies. Calendar view – schedule bills to pay, due invoices, to do activities and other events in one place; view them daily, weekly, or monthly; on the side pane see what’s coming up and what you’ve missed. Excel Integration – QuickBooks allowed to export data to Excel but now additional feature permits to update a worksheet you already created with most current information; you can even adjust the date range for which you want the report, all that without affecting the formatting already created and applied to the previous worksheet. Memorized Transactions – select transactions that repeat and schedule their automation; you can select similar transactions and process them at the more convenient time. QuickBooks is a very dynamic software that continues to innovate on its own and based on users’ suggestions. The community is a mine of ideas where users can enhance the product directly by creating their own reports that can be shared on Live Community and critiqued. If you like any of the tailored reports, simply download them and incorporate them into your version of QuickBooks Premier.